Today I welcome Allison Morse, author of the Tween-YA fantasy, The Dragon's Shadow. (I don't know about you, but who can resist a book with dragons in it?) Be sure to check out the contest, too! She walked to the clearing and stared up at the cave. Taking a breath, she lifted her hand onto the first rock and pulled herself up. She climbed the steep rocks that led to the dragon. Three teledicthus glided in the air, two large and one small. They swooped past her, jaws snapping. Oddly, she didn’t fear them. What did, resided in the cave. At the top, she stood in front of an enormous opening, the size of a jet hangar. She peered in but saw only darkness. Kylie stepped into the cave. The rhythmic sound of breathing echoed around her and the air tingled with electricity. A huge outline appeared. Her gaze followed it, trying to make sense of its parts. A pulsing wall of scales the texture of seaweed glittered and glowed in the vast darkness. A long, callused neck rose before her, topped by a head with two large nostrils oozing a clear, sticky film that covered the inside of the cave. The beast lowered his horned head directly in front of her. Kylie stood face-to-face with the dragon. About the Author: Allison Morse is the author of three very different novels: Fallen Star a Hollywood Gothic mystery, The Sweetheart Deal, a Rom/Com, and Dragon’s Shadow, a YA Fantasy Adventure, all published by The Wild Rose Press. She lives with her wonderful husband in a house in the hills filled with books. 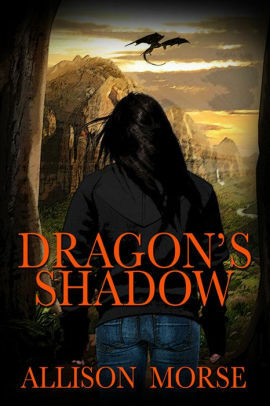 Thank you for hosting Dragon's Shadow. I appreciate it!